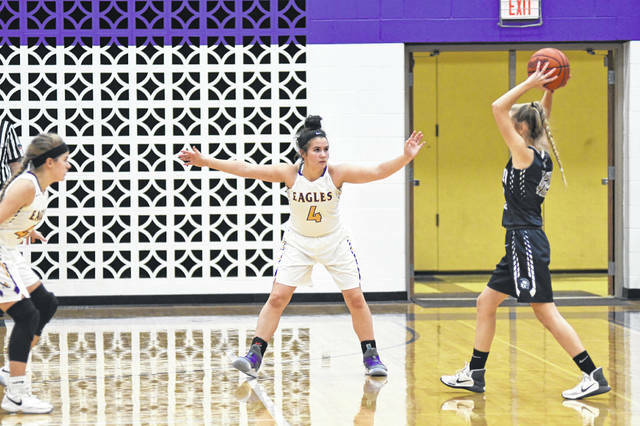 Eaton’s Lexi Miller brings the ball up court during the Eagles basketball game with visiting Valley View on Thursday, Nov. 29. Eaton had an off night making just 8-of-41 shot attempts and turned the ball over 29 times in a 54-19 loss. 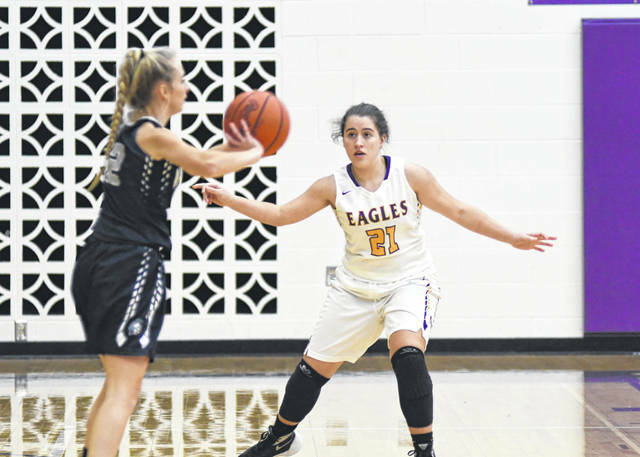 EATON — A cold shooting night and too many turnovers proved costly for Eaton’s girls’ basketball team in a 54-19 loss to Valley View, the defending Southwestern Buckeye League Southwestern Division champion, on Thursday, Nov. 29. Eaton shot 19.5 percent (8-of-41) from the field, including going 4-for-31 over the last three quarters, and committed 29 turnovers. They struggled at the free throw line as well going 2-for-13. 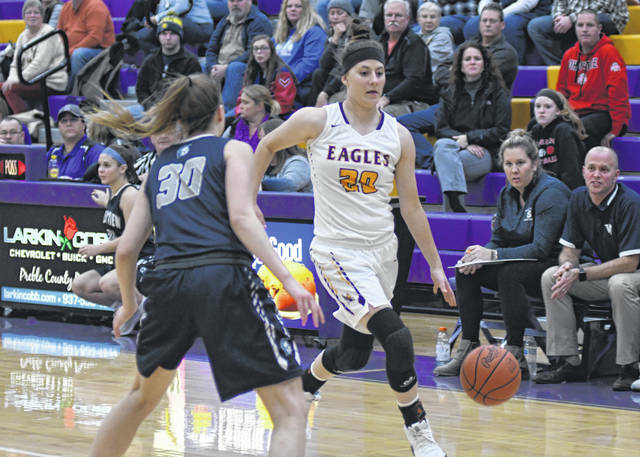 The Eagles (1-2, 0-1 SWBL) fell behind 7-0 less than three minutes into the game while committing turnovers on three of their first four possessions. 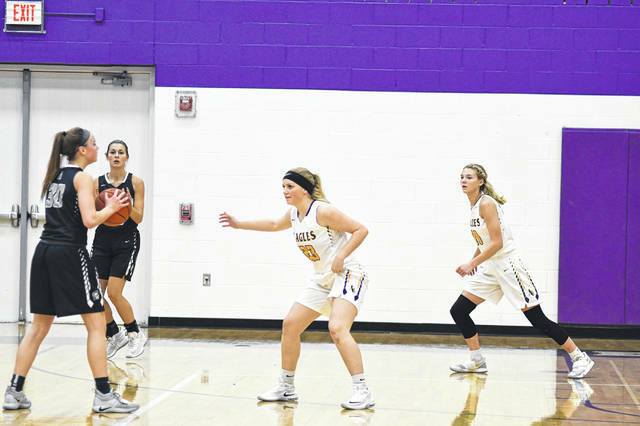 Eaton made a run to close the gap to 7-5 on a pair of free throws from Bailey Shepherd and a three-pointer from Annika Gels and eventually tied the game at 11-11 with 2:18 to play in the first. Shepherd scored eight of her team-high 10 points in the quarter. From there it was a struggle offensively for the hosts. The Spartans led 15-11 after one and held a 16-13 lead with 4:54 to play in the first half. Eaton went nearly 11 minutes before it scored again. Valley View went on a 24-0 run to take a 40-13 lead with 2:36 left in the third. 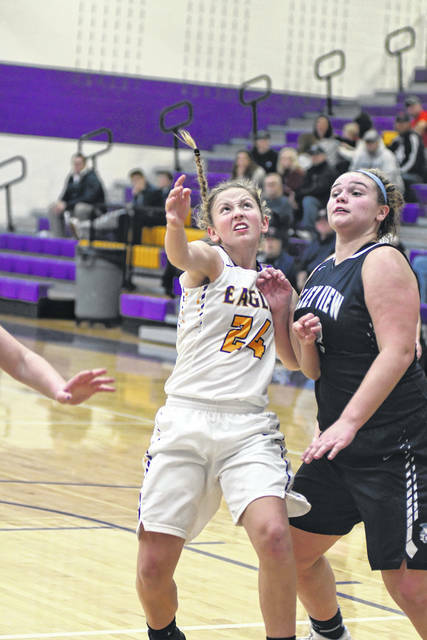 A basket by Lexi Miller ended the Eagles drought at the 2:02 mark to make it 40-15. In addition to her 10 points, Shepherd added eight rebounds and four steals. 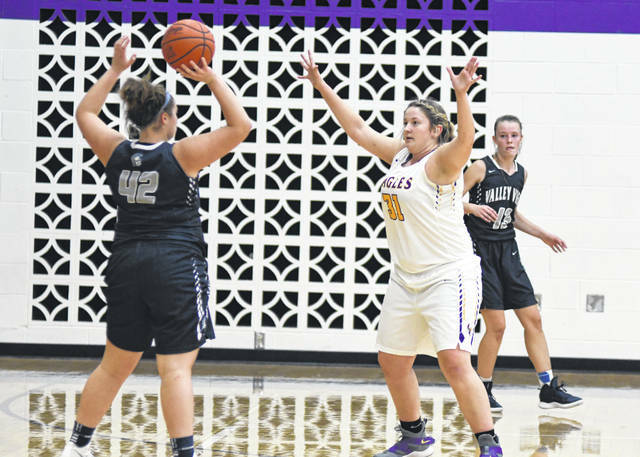 Miller tallied four points and three rebounds. 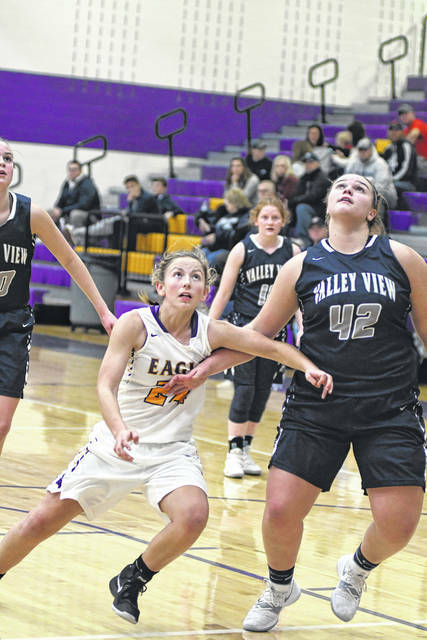 Emily Dungan had four rebounds and four steals, while Becca Mowen and Allison Mowen each had four rebounds. Eaton was scheduled to play at Middletown Madison on Monday, Dec. 3. 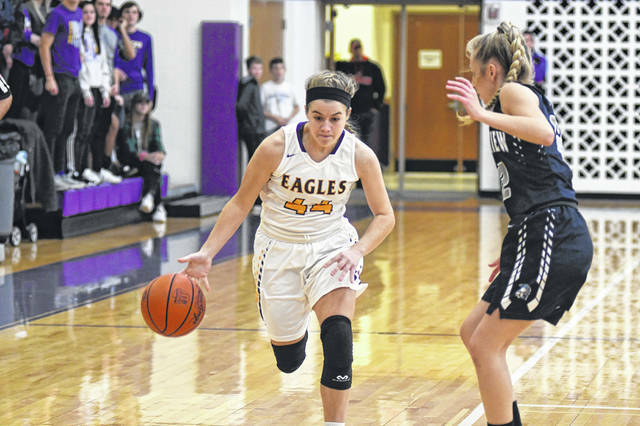 The Eagles will also travel to Brookville on Thursday and will host Oakwood on Saturday. 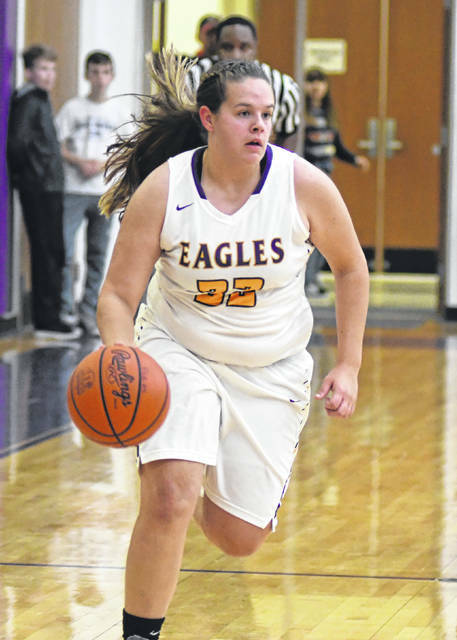 https://www.registerherald.com/wp-content/uploads/sites/41/2018/12/web1_ehsgbk5-1.jpgEaton’s Lexi Miller brings the ball up court during the Eagles basketball game with visiting Valley View on Thursday, Nov. 29. Eaton had an off night making just 8-of-41 shot attempts and turned the ball over 29 times in a 54-19 loss.